Is Croatia on your bucket list? Then this a perfect opportunity for you and your family, to explore the beautiful Adriatic Sea and discover their unique culture. Predator 62 is located in marina in Split in charming Croatia. If you are amateur and you don't have any level of skills required for cruising, you don't have to worry about that because in the price of rent one of our professional skippers is included and he will take you on a holiday of your dreams. Also, on the boat, there is a hostess, who will try to make your vacation the best way possible. Since it is located in marina in Split we suggest you visit the Split the second biggest city in Croatia and after islands nearby such as Brač, Šolta, Hvar etc. You need to explore them as much as possible, each of them is charming and unique in their own way. We are sure that your main activities will be to swim in turquoise and emerald waters, relax on the boat while feeling the sea breeze, sailing, and walk along beaches and paths often deserted. 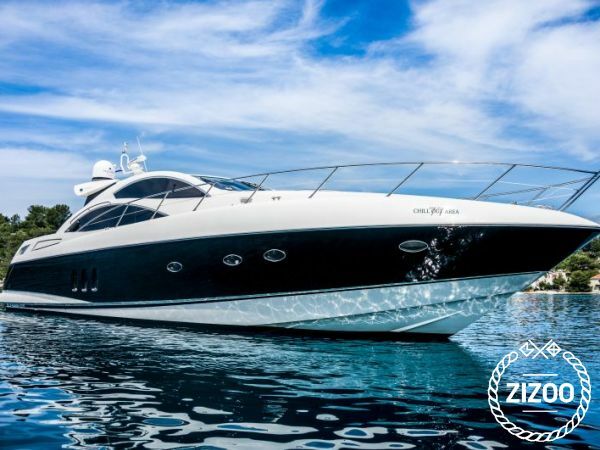 The motor yacht is equipped with all of the necessary cruising safety items that you may need to have a carefree and safe environment while cruising. You can find: SAT Flat screen TV in all cabins and saloon,Blue ray&DVD Player, Bluetooth music boxes, Alpine sound system, Bose Hi Fi DVD/CD surround sound system linked to cockpit, SKY Premium, Air condition in all cabins and saloon, Internet connection, water maker, ice maker, outside BBQ. It is always superbly clean and comfortable and allows for those unforgettable moments cruising with friends or family to come to life. The boat has three big rooms: Master room with double bed, VIP room with double bed, and guest bunk bed room. The rooms are well equipped and they have everything you need for your vacation. If you feel adventurous and brave enough, on the boat you can find many sea toys which are included in price as well. Such as: Avon 3.60 m or optionally Jet Ski Sea Doo GTX 300 Limited Scubajet, Paddle Board, Kite Board, Water ski, Mono ski, Donut, Snorkelling equipment. See you soon!